A.M. Tenter and A.M. Johnson, Phylogeny of the Tissue Cyst-forming Coccidia. P.S. Coulson, The Radiation-attenuated Vaccine against Schistosomes in Animal Models: Paradigm for a Human Vaccine? J.M. Kelly, Genetic Transformation of Parasitic Protozoa. G.H. Coombs, H. Denton, S.M.A. Brown, and K.-W. Thong, Biochemistry of the Coccidia. C.A. Facer and M. Tanner, Clinical Trials of Malaria Vaccines: Progress and Prospects. Subject Index. 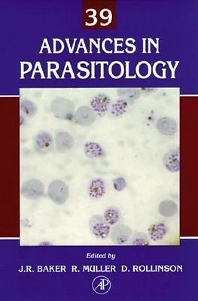 Advances in Parasitology is a series of up-to-date reviews of all areas of interest in contemporary parasitology. It includes medical studies on parasites of major influence, such as typanosomiasis and scabies, and more traditional areas, such as zoology, taxonomy, and life history, which shape current thinking and applications. Parasitologists in all branches of the subject.